And here's the current toy storage solution. It's a stacking unit and in a crazy moment I almost put the top unit on the floor. Then I realized I couldn't keep the ball bin out of reach or all the block sets and that would have possibly driven me over the edge. I'm trying to rotate them out and it could still use a purge or two but mostly everything has a place right now which is good enough for me. Since we didn't really leave the house this weekend (except to walk to Starbucks, or the Barnes and Noble Cafe that serves Starbucks coffee) I made crazy progress on the craft/genealogy room/office and here's just a sneak peek but at least for a little while, Family Photo Fridays are going to be back on! I LOVE this Valentine card, especially the fact that when you pull the little heart the plane moves. It was given to my uncle Julius from Edna Glnaro. Since Julius was born in 27, I'd guess this card was late 30's/40's. 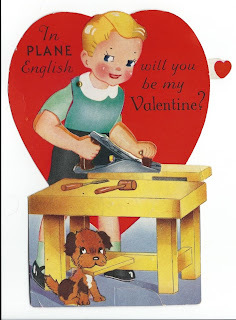 I love the puns and word play used on some of these old Valentines. Wish grandma had more with names on them but I'm sure if they were that important the kids had them squirreled away in their rooms.